Race four happened today with our biggest turnout so far of 31 competitors under the watchful eyes of lead marshals Gary Brady, Aidan Glacken and their team. Showers were never far away but we were lucky to avoid rain for the duration of the race. There was a strong head wind for most of the cycle and this resulted in times being slightly back on last week. 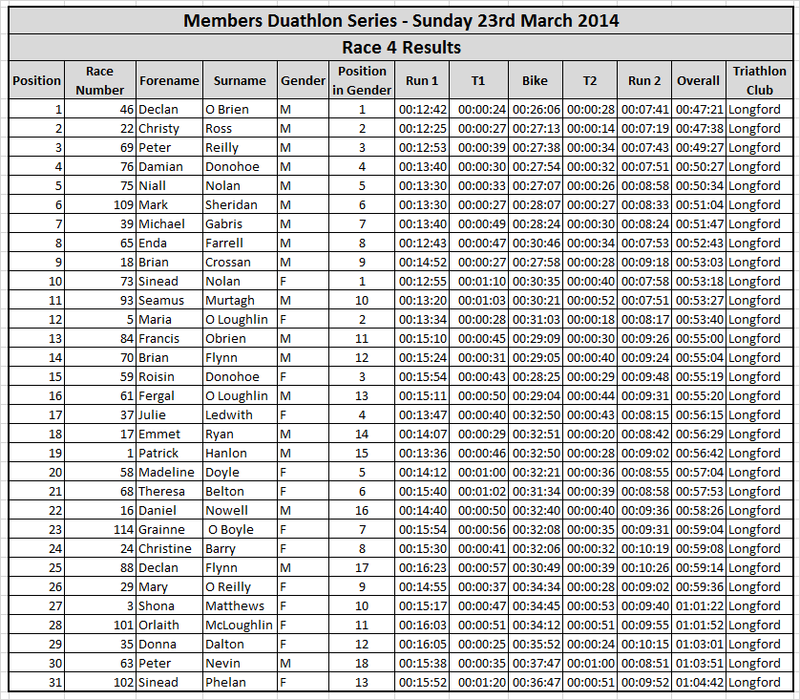 Today's race was won by Declan O Brien with a margin of 17 seconds over previous race winner Christy Ross. Female winner Sinead Nolan's times have been steadily improving over the 2014 duathlon series races and Sinead took today's first place slot after being in the top three for most of this year's races. Last weeks winner Maria O Loughlin was still up there crossing the finish line 22 seconds later in another good race by Maria.